One of the most used tactics by the U.S. government when countries start to think sideways is to give them a little taste of the overwhelming force that would descend upon them should they make war inevitable. With that perhaps in the back of their minds, the U.S. Navy ships assigned to Commander, Task Force (CTF) 30 and CTF 70 began a series of exercises with the Republic of Korea (ROK) Navy to strengthen maritime interoperability and tactics, techniques and procedures. 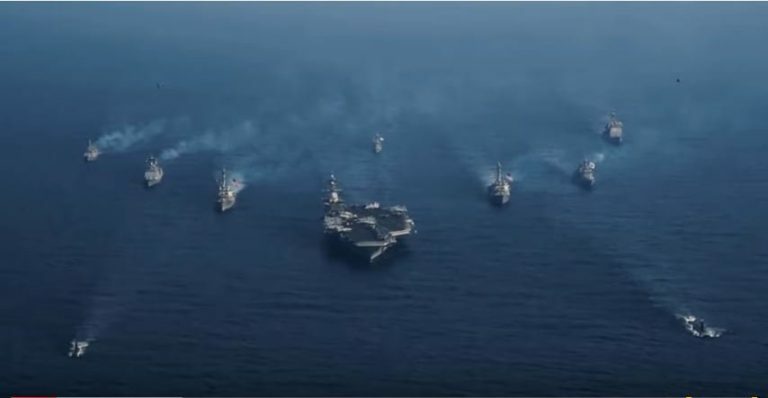 The U.S. routinely conducts carrier strike group (CSG) operations in the waters around the Republic of Korea to exercise maritime maneuvers, strengthen the U.S.-ROK alliance, and improve regional security. The U.S. Navy maintains a presence in the Indo-Asia-Pacific to help preserve peace and security and further our partnerships with friends and allies. Our forward presence contributes to freedom of navigation and lawful use of the sea, as well as furthers operational training and enables an exchange of culture, skills, and tactical knowledge. The exercises will consist of a routine bilateral training, subject matter expert exchanges, anti-submarine and anti-surface warfare drills, communication drills, air defense exercises, counter-mine planning and distinguished visitor embarkations. Additional surface, subsurface, and air assets joining the bilateral exercise include Carrier Air Wing 2, Arleigh Burke-class guided-missile destroyers USS Barry (DDG 52), USS Wayne E Meyer (DDG 108), USS McCampbell (DDG 85), USS Stethem (DDG 63), Los Angeles-class nuclear fast attack submarine USS Columbus (SSN 762), and P-3/P-8 Maritime Patrol and Reconnaissance Aircraft from Commander, Task Force 72. After seeing all of these assets, which would be just the beginning, North Korea needs to think very careful of how they thread.